More than 270 tiny drinking dens are crammed into seven ramshackle streets here. Each place has a unique vibe – ranging from high-end cocktails to hard rock – and the atmosphere can be anywhere from friendly to downright hostile. 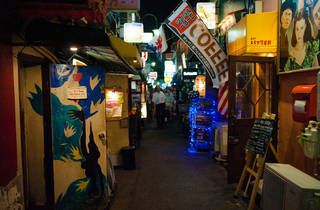 If the Golden Gai existed in London, I reckon it would be the next hipster place to go, second to Shoreditch! 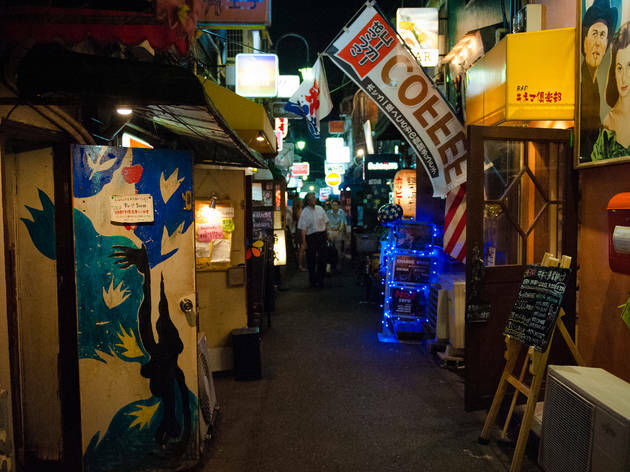 Rows upon rows of narrow alleys laden with izakayas (Japanese bars/pubs), quaint and dark, a bar crawl round here would not end well. Just off the busy main section in Shinjuku (Tokyo’s Piccadilly), it doesn’t stand out unless you know what you are looking for and doesn’t pick up until post 9pm where you can hear some of the worst karaoke coming from most bars! Definitely a must! This a great place to go bar hopping. It still is mostly locals and due to the size of the bars you get to chat to people sitting close to you. Even some locals that did not speak much of English made an attempt. The bars stay open until 5am. There are cover charges to go into the nicer bars and the night can end up quite pricey. It does feel like you have gone back in time going there and it is such a unique experience you have to try. Be warned some bars are not tourist friendly but you can easily suss out which ones they are.